If not, any schematic lying around? It's a preamp that was in my friend's Rhodes. Apparently bass/treble and volume. Bass/Treble is on a concentric pot. I going to fix it (the pot fell out), but I wanted to see if I could get more info. Hey Aron, cheers on your immensely useful site. I was just reading it earlier today as it happens. The 9V battery makes it conclusively aftermarket--there were no battery-powered pre's to come out of the Rhodes shop. The IC is sanded. This guy was a early pioneer of copy protection! Kind of a puzzler--if it were an opamp you'd kind of expect back-to-back 9V. The only audio amp IC I can quickly recall that runs single-sided supply (LM386) is not exactly audiophile material. You think that's what we're looking at? I love how it's zip-tied in the socket. Standard op-amps can be run either by a single voltage rail (unipolar) or a dual voltage rail (bipolar). There are countless millions of guitar pedals running op-amps from a single 9v battery supply (and without using a charge pump to get bipolar power), so the power arrangement in the photos is nothing unusual. Judgin by the low component count, the IC is probably being hooked up in its simplest form as per typical op-amp datasheets, with two simple passive tone controls thrown in. To be sure they can--but what happens to the negative going portion of the signal when you use that configuration? Indeed. Doesn't seem to cause problems in this application though. 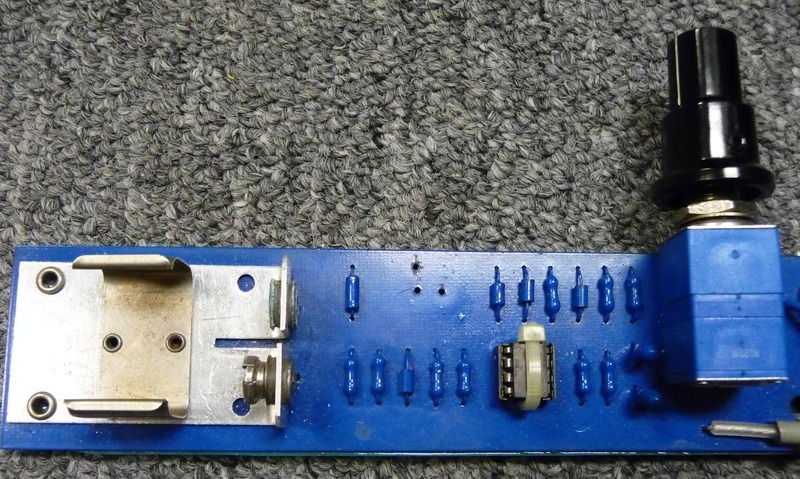 The secret to using an opamp with a unipolar power supply is all in the DC biasing. One can bias an opamp running from one 9V battery with half the supply voltage using a resistive voltage divider. Now, the opamp's 'ground' reference is actually at 4.5V. Blocking caps are used on the input and output of the signal path to allow for 'bipolar' signals... recentering them DC-wise around 4.5V for the opamp. i.e. a 440Hz input signal goes between +/-0.1V (referenced to 0V). Input blocking cap recenters it for opamp around 4.5V, so it goes from 4.4V to 4.6V. Opamp gains it by 10x, so the output is now going from 3.5V to 5.5V. It goes through another blocking cap and into a 0V referenced load (your power amp), which recenters the output around 0V , +/-1V. One must be careful of the component values selected in order to insure the EQing is not affected. That is most likely a Stewart preamp (an early one). They were notorious for trying to hide the circuitry - with blue paint and later on by molding the IC completely in black resin of some sort. Stewart was competing with Dyno at the time, and I believe was a pretty low production company. I have only heard one once, and it was mildly interesting. Re: Does this look aftermarket to you guys? It's also possible to make a split rail from a single DC source. Basically make a resistor voltage divider between the rail and gnd and put an op-amp in voltage-follower configuration on the center - the output of that op amp is now a low-impedance node creating a new reference "ground", the old ground is now -(1/2)railV and the other +(1/2)railV. They make "virtual ground" or "ground reference" ICs that are specialized to this task, like TI TLE2426CP. I wouldn't bother in the case of the Rhodie preamp, because you don't need a low-impedance super-stable ground reference simply to feed an input pin on an op-amp. The simple resistor divider does just great. Also, I have built the Rhodie preamp circuit, and it sounds just fine, but when you remove the LM358 op-amp and put in a more modern op-amp, like SE5532 (or NE5532 or TL072), it sounds much better - like immediately noticably better. I don't think anybody would choose the LM358 nowadays.